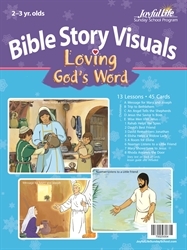 These beautiful, full-color flashcards captivate children in making the Bible story come alive. The stories are presented in a way to appeal to the hearts as well as to the minds of the children. The story text is included on the back of the cards and in a separate lesson guide.